Until this point, Ford's Sync with Sirius travelink has been our undisputed champ of navigation system greatness, but with the announcement of updates to the Audi MMI system, that crown may be up for grabs. Since this new system has only just been announced, we obviously hadn't had a chance to put it through the paces yet, but by-jove it certainly does look pretty. The new MMI takes all that was integrated in the original system — audio, digital television, navigation, and points of interest — and makes it actually easy to use and pretty to look at. New are very cool 3D graphics in the nav systems for notable buildings and perhaps even cooler, reveals terrain elevations when viewed in perspective view. Other upgrades include a bigger hard drive for all your favorite media, and the ability to playback DVDs, as well as MP3, AAC and WMA files on CDs and SD cards. It's all very fancy and you can read all the details below. We just want the cars the system comes in, that would be enough to make us happy, MMI or not. Audi is increasing its lead in infotainment technology even further. A new generation of the MMI, the supreme solution for multimedia, communication and operation, has been announced. With a high-capacity hard disk, a DVD drive and fast processors, it is much more versatile and its performance is higher than ever before. The new MMI’s first appearance will be in the A8 luxury sedan, but before long it will also be available for two other model lines. In 2002, when the Audi MMI (Multi Media Interface) was launched, journalists and the general public were unanimous: the new Audi concept was the best on the market. With its control knob on the center tunnel and large function keys to select the main operating areas, it was effortless to control, with self-evident logic that was repeated on the MMI display. Audio, TV, information, telephone and navigation – never before had the driver been able to control all these areas so intuitively. MMI set new standards from the very start, and proved to be the yardstick the competitors had to equal. Its status was confirmed by many wins in comparative tests. The system was also adopted for the A6 and Q7 model lines, and for the new A4. In this area of technology, the brand with the four-ring emblem pioneered progress from the front. Audi has been intensively developing every aspect of its MMI system. The full version, MMI navigation plus, is now a state-of-the-art high-end system. The basic operating principle has been retained, but the innovative joystick makes it even more convenient. This joystick is located on the central knob and can be moved in eight directions – with high precision and the sense of quality that the Audi driver expects. Apart from the control terminal, the monitor screen is the second important interface between the system and its users. For the new MMI, Audi has provided a large TFT display measuring seven inches from corner to corner. It is located in an ergonomically favorable position high up on the center console. With the very high resolution of 800 x 480 pixels and LED backlighting, this monitor supplies an exceptionally sharp image with plenty of contrast. Even in poor light conditions, the colors are intense against the black background. As before, there are elegant crossfades between the individual screen displays, an effect that makes the overall impression created by the graphics even more fascinating. If the driver alters the automatic air conditioning settings, the new ones appear in a small screen panel for several seconds. This pop-up window doesn’t occupy very much space, so that the MMI user can still see the main screen content at any time. On the big screen, the stage is set for another of the new MMI system’s attractive innovations: the way that maps are presented when the navigation system is in use. The driver can choose between the conventional two-dimensional view and the new 3D images. These feature a birds-eye perspective of the map area, with plenty of carefully presented detail. As in an atlas, the various heights above sea level are shown in different colors, and the most important buildings in large cities appear in three dimensions. 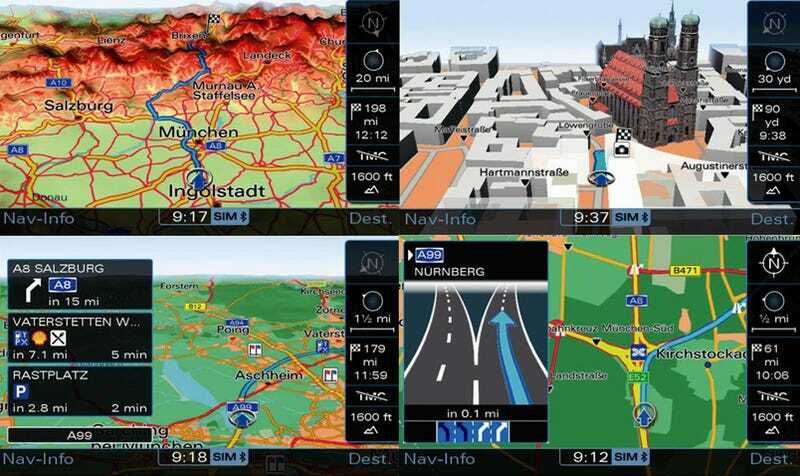 Audi has extended many of the navigation system’s functions. For instance, additional detail maps are faded up at crossroads, with small extra arrows indicating the correct lane to follow. Whenever it seems sensible, the navigation system offers the driver a choice of three routes, including the one that’s likely to keep fuel consumption to a minimum. If the driver uses voice input to load a destination into the navigation system, this can now be done without spelling out the individual letters. The new MMI understands complete words in a number of national languages. The same applies to the new high-performance telephone directory, which can store up to 5,000 entries each with five numbers for each user. The technology used here is called “synthetic language”. In a studio, pairs of individual sounds – these are called “diphones” – are recorded and saved to part of the MMI’s memory as data sets. High-speed software identifies them in the driver’s commands, combines them and compares the complete words with the term in the list, for instance “August Horch Strasse Ingolstadt”. The same synthetic language principle is used in reverse for the audible guidance instructions, which sound smooth and natural. The driver can choose between detailed or compact audible guidance modes. In the entertainment area too, the latest Audi MMI sets new standards. It has an integral drive for video DVDs; the new joystick function on the control knob is especially practical for this. When played back with the optional sound systems, DVD soundtracks can be heard in Dolby Digital 5.1 multi-channel sound and other frequently used formats. For safety reasons, the picture is only displayed to the driver when the car is standing still. The system also plays music from CDs and SD cards, including those coded MP3, AAC and WMA. Additional technical modules have made the MMI even more attractive. The optional Audi Music Interface makes a perfect connection with an mp3 player, for instance the customer’s iPod. The complete menu structures and contents appear on the MMI display, and control is at the MMI terminal or the multifunctional steering wheel. A universal socket in the glove box and an adapter can be used to connect various players with a USB interface, and analog audio and video equipment. Another audio highlight is the option of DAB (Digital Audio Broadcasting) reception. Digital radio signals are far superior to the analog standard in quality. Audi always uses a DAB double tuner in the MMI. This concept has the advantage that the DAB reception frequency can be changed without any interruption. One tuner receives the music signal, while the second searches continuously for alternative frequencies on which the same program is being broadcast. If a changeover takes place, it takes only a fraction of a second. Another advantage is that the list of stations is continuously updated. The MMI system’s modular structure makes it possible to integrate a CD changer and an analog/digital TV tuner. Audio quality is assured by a choice of sound systems. The top version in the Audi A8 comes as before from the Danish manufacturer Bang & Olufsen. With its rich, subtly differentiated sound spectrum and extended treble response from the tweeters, it provides pure delight for the ears. The telephone is even more convenient to use with the new MMI. Using a Bluetooth chip, the system can fully integrate customers’ cell phones that support the SIM access profile. The MMI phone is ready for action as soon as the ignition key is inserted. It reads data from the SIM card and the memory into the A8’s own memory, then shuts the cell phone down completely. Telephone operation via the car’s antenna is the key to optimal reception quality. A digital voice processor ensures the best hands-free quality; voice outputs are through the car’s sound system. The fantastic selection of functions that the new MMI offers is backed by hi-tech in concentrated form. The ‘main unit’ computer is installed in the center console, and integrates all the functions that were previously performed by five separate units, including the DVD drive. One of its key components is the hard disk; 10 GB of its 40 GB capacity can be used as a jukebox, to store up to 4,000 tracks, all sorted for easy access. The hard disk also contains navigation data and an electronic logbook for the car. Two processors, an 800 MHz chip and a 500 MHz digital signal processor, allow all applications – navigation, voice input, telephone and audio functions – to operate simultaneously, although each of them needs high performance from the computer. Using the 3D graphics processor from Californian 3D chip manufacturer Nvidia gives the MMI access to the third dimension. Audi has used this chip’s outstanding performance with graphics for the first time to provide a genuine 3D map display – a ‘digital topographical model’. With this processor, the screen display sets new standards: it is attractive, with high resolution and presentation quality, smooth animation and crossfading. A second block, the ‘radio unit’, combines the tuner and sound system functions. A central interface connects the two units with the rest of the car’s network. All the new MMI components have been developed to comply with strict specifications issued by Audi in Ingolstadt. Audi’s quality standards are as stringent as they always were. This is important because in-car operation, with extreme temperatures and vibration, imposes severe stresses on the electronics. The new MMI will extend Audi’s lead over its competitors. It can be ordered as of now for the A8 luxury sedan, and will be available before long in the Audi A6 and then in the new Audi Q5 performance SUV.